Completing every Dead Island challenge in PlayStation Home will unlock an "exploding meat weapon" in the final game. In a continued effort to support "Total Game Integration," Sony's PlayStation Home servers have been infected with Dead Island zombies. 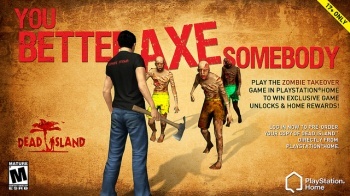 Right now, you can login, take a zombie survival quiz (here's a tip: the head is the weak spot), then chop the undead hordes to pieces in a Home-exclusive survival game complete with ten challenges. Complete some of these achievements and you'll unlock Dead Island-inspired gear - you know, to match the wasteland that is Home. Complete every challenge, and "Exploding Zombie Bait" will be waiting for you in the retail version of Dead Island. Sony first introduced Total Game Integration in January leading up to the release of Killzone 3. Players were tasked with repelling a Helghast assault on the PlayStation Home Central Plaza. Completing all three levels rewarded players with points, which were redeemable in the game for multiplayer weapons and abilities. I was initially going to ignore these shenanigans, as the Killzone 3 activities weren't worth the trouble, in my opinion. However, Exploding Zombie Bait! PSN users can also pre-order the game - which is set to release on September 6 - directly through Home's interface, unlocking an exclusive "exploding zombie outfit" for their avatar. One Man Army - Survive all three waves of zombies in single player. Iron Will - Survive an entire wave in multiplayer without being downed. Nobody Left Behind - Survive an entire wave in multiplayer with all four players. Reward for completing challenges 1-3: Dead Island deck chair furniture item. "A" for Style - Kill zombies using every available finishing move in single or multiplayer. You Got Red on You - Stack up 100 kills in single or multiplayer. They Belong to Me Now - Cut off 200 limbs in single or multiplayer. Reward for completing challenges 4-6: Dead Island suitcase furniture item. Handyman - Craft 10 different weapons. Here, Have Some Random Stuff - Craft and donate 10 items to the community. Smorgasbord of Stuff - Craft and donate every type of item to the community. Reward for completing challenges 7-9: Dead Island electrical machete furniture item. Completionist - Complete all nine challenges. Reward for completing challenge 10: Exploding meat weapon for use in Dead Island.